You can read my other sheep breed closeups here. This is a long staple fleece (about 7 inches) with no crimp and is more coarse and straight from what I'm used to seeing (North American). The sample had distinct dark brown and white without any light gray (lilac) color. It's not the softest handle but would probably be OK for outerwear. To be honest, I was not a fan of this sample at all. It seems like mostly kemp and feels like mattress stuffing. It could just be this particular sample, but it was one of my least favorite of many breeds I've looked at. The Whitefaced Woodland is a large breed of heavy horned British hill sheep. It also known as the Penistone sheep after the Yorkshire town where it dates back to 1699. It is listed as a vulnerable breed. In the podcast, Martin said that this doesn't look like a UK Romney fleece at all. It is in fact from the US. They have a very dense fleece with a broad crimp and squared off tips on broad flat locks. 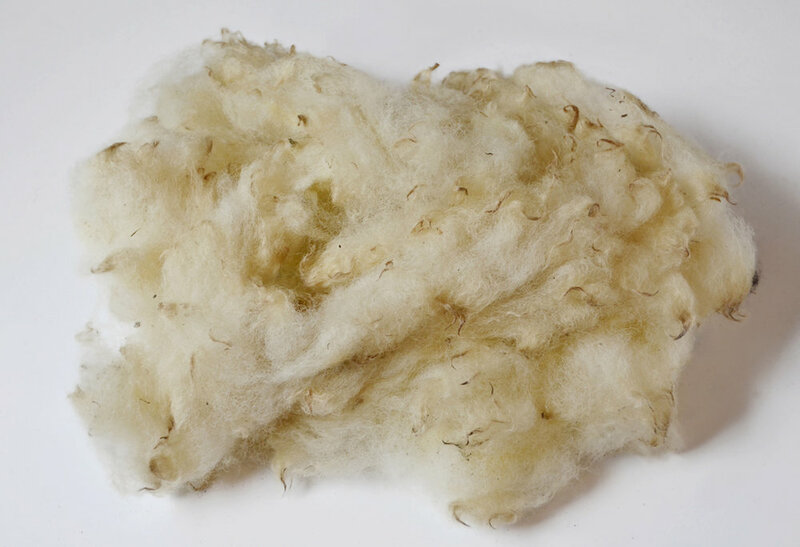 I've spun a lot of Romney from local Virginia farms and I would say that this is very comparable to those fleeces. They are classified as a longwool although they don't grow as long as others like Lincolns or Teeswaters for example. I really liked this sample. It's very clean and has a nice luster. Martin said that in the show ring it may not be as good because it doesn't have as even a crimp and lock formation and blocky tip that you would like to see with this breed. This sample was very interesting. 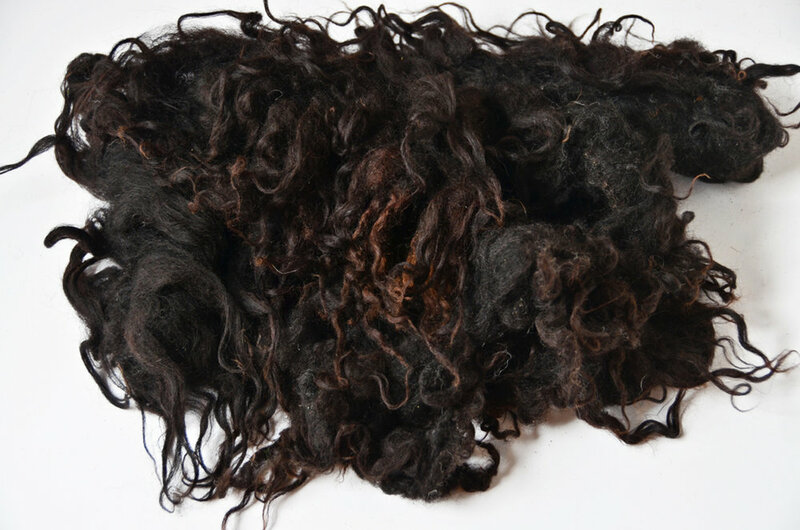 it's very soft and fine with a few inch staple and wavy crimp with long tips similar to a Shetland in handle. It does not have any coarse hair like some primitive breeds. There are some small bits of white kemp but nothing too bad. Martin thought it was a lamb fleece because it is very soft with fine tips. It is a tender fleece though, so when you tug on the ends, it will break apart. Natalie said it could be because they were rooing though when it was sheared. I noticed that the cut end is where the breaks occur, so I agree that it would naturally break there and the tips are actually stronger. "The Boreray is a breed of sheep originating on the St Kilda archipelago off the west coast of Scotland and surviving as a feral animal on one of the islands, Boreray. It is primarily a meat breed. Also known as the Boreray Blackface or Hebridean Blackface, it is the one of the rarest breeds of sheep in the United Kingdom, and is one of the Northern European short-tailed sheep group of breeds. It is the only sheep breed to be listed in "Category 1: Critical" by the Rare Breeds Survival Trust, because fewer than 300 registered breeding female Borerays are known to exist. The Boreray should not be confused with the Soay sheep, also from the St Kilda archipelago, nor with the Hebridean sheep, which was formerly called the "St Kilda", although it is probably not in fact derived from the St Kilda sheep." "The Boreray is a primitive breed. They stand approximately 55cm at the withers. The tail is short. Both sexes are horned and the horns of the ram are large and spiral. The face and legs are black, tan or grey, often with dark marks on a white background. The wool is predominantly cream or light tan with a small proportion of sheep having grey or dark brown wool. There is sometimes a dark rump patch and a dark colour, particularly in rams. Average mature ewe weighs 30kg. Boreray Sheep are the descendants of the domestic sheep which were kept by the St. Kildans. When the inhabitants evacuated Hirta, (the main island of St. Kilda), in 1930, all their domestic stock was evacuated with them. Any stock left on the island was killed. But a replacement flock of domestic sheep had been kept on the island of Boreray. These sheep were left there after the evacuation and have lived feral on the island since 1930. In recent years a small group was taken off the island and the descendants of that small group are now registered with the Rare Breeds Survival Trust." I really love this sample. It's much nicer and softer than the one in the September 2013 Breed Box. This is another one that the cut ends will break off about 1/2 inch from the end and I believe was rooing. I really like the lock formation with it's long waves that come to a pointy tip. The sample is a bit felted but would make a great tailspun yarn boa. So as far as spinning, this would be tough to spin in a traditional fashion, but I would keep it's lovely primitive character and keep the fleece intact. If I had a larger sample, I would felt it into a rug. "A small, fine boned sheep with black wool and two or more horns, belonging to the North European short-tailed group. Usually a dark brown colour, the Hebridean is horned in both sexes, some rams having 4 horns. From the Western Isles, the Hebridean became popular as a parkland sheep in England in the 19th century."